The World of Farland is a meticulously mapped and detailed campaign setting designed to be used with the Fifth Edition of the world's most popular Roleplaying game, Dungeons & Dragons®. Farland has a detailed history spanning many millenia, providing a rich, realistic backdrop that many campaign settings lack. Every clue and detail that players discover will lead them to further, nearly limitless aspects of the world, providing an immersive gaming experience. And now you can download digital books or purchase hardcover books so that you have all of your Farland content in one place! You can get the World of Farland Players Guide here, the World of Farland Gamemasters Handbook here, and World of Farland Campaign Setting here! On this site, you'll find roleplaying resources such as adventures, class paths and features, feats, magic items, NPCs, spells, and much more. To use this website, you will need the Players Handbook, Monster Manual, and Dungeon Masters Guide, published by Wizards of the Coast. Farland is primarily a free resource for people's pen and paper RPG games, although there are now online games at our host Myth-Weavers. You can set your roleplaying campaign in Farland. And better yet, Farland is updated often, usually on the 15th of every month, so bookmark or check back. You can also follow us on Twitter. Look at the menu below the banner. Start by checking out the "Setting" link, which will give you details about the campaign setting, including its geography, history, populations of people, and even its metaphysics. Then look at the "Players" link, which will give you rules information for your game, including original options for races, classes, magic items, and more. After that, you'll want to use the links in the top menu from left to right. If you have other questions, check out our more extensive FAQ. 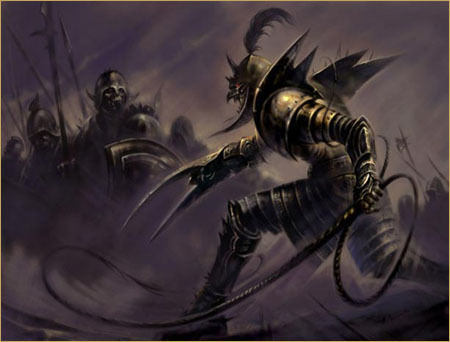 If you are new to Dungeons & Dragons® or to roleplaying, start here. This is a lot of content! Can I get this in book form? Now you can! The fans demanded it, so we delivered! Now you can purchase digital and hardcover books so that you have all of your Farland content in one place, accessible at your fingertips even when you aren't online. Plus, our new publications contain exclusive content not available on the website! You can get the World of Farland Players Guide here; it contains original Farland races, class options, background and customization material, equipment, spells, a players' map, and more! You can also get the World of Farland Game Master's Handbook here. It presents all of the compiled material for GMs from the website, plus exclusive new content, like new monsters and magic items, not here on the website. 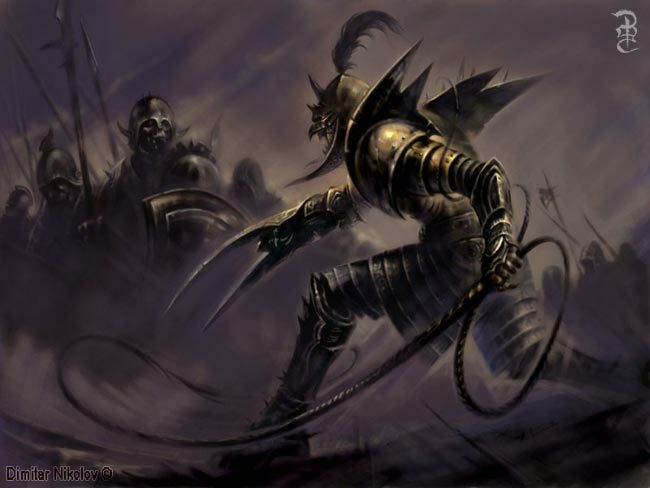 It also includes setting history, metaphysics and the planes, monsters, magic items, and guidance for running campaigns set in a world conquered by evil and ruled by the Lords of Sin (including detailed stats of the Deadly Lords). It also comes with a Game Master's map! 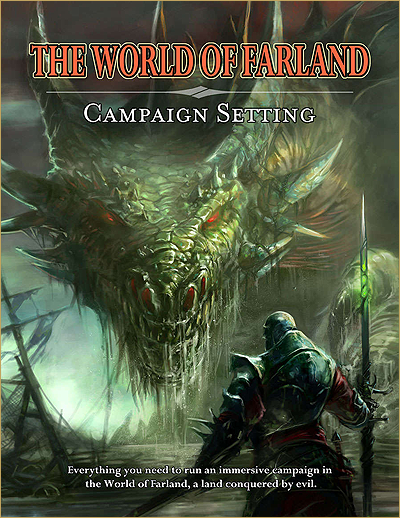 The World of Farland Campaign Setting compendium is now available! The setting compendium contains details about the world, including geography, populations of peoples, history, pantheon, maps, and more. Plus, it contains content that won't ever be available on the website, like factions of Farland, lots of adventure options, new NPCs, and much more. In addition, it comes with a detailed map. Get it here! And if you want a slightly different Farland experience, check out our World of Farland: War of Immortals Campaign Setting! This book is set in the distant past of Farland, when human culture was barely developing and elves and dwarves fought for the very fate of their civilizations. This book (available in a digital and hardcover version) contains two full-length adventures, as well as tons of other useful stuff. Get it here! What if I play D&D but I don't play 5th Edition? Farland has you covered. There is also a version of Farland that uses the 3.5 Edition rules and the 4th Edition rules. Both of these sites have a long history on the web, and both are every bit as detailed as the 5E site, although only the 5e site is updated.